I live with my mom Lynsey, dad Chuck, 11-year-old brother Rhett, and our Golden Retriever Majors. I’m a daughter, sister, granddaughter, friend, softball player, lefty pitcher, artist, Honor Roll student, sushi lover, popcorn enthusiast, social media junky, and listener of music of all kinds who happens to have Cystic Fibrosis. My sports teams are the University of Tennessee Volunteers, St. Louis Cardinals, and New England Patriots only because of Gronk. I was diagnosed with CF when I was 18 months old because of failure to thrive, just a few weeks after my brother Rhett was born. Today I’m 5’6 120 lbs.! For the most part I’ve been healthy, but have seen some changes in how I feel on a day to day basis. I’m known for my softball ability as a strong lefty pitcher with a calm demeanor on the mound. Not too many people in the softball world know I have CF. 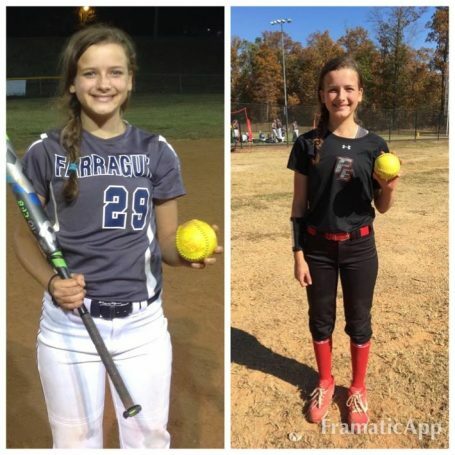 I currently play for Farragut Middle School Varsity and Force Elite Champions 03 out of Dalton, GA. I love being inside the pitching circle, the one on one battle between me and hitter, the pressure, getting a strikeout or ground ball out when the game is on the line or close. Being a pitcher takes work and dedication! At the age of 8, I decided to be a pitcher and never stopped. Those first few years were rough but now I’m seeing the results from my dedication. Having CF has taught me to be mentally tough as well as a leader when battling adversity. Just recently I cleated myself in a game sliding into home but stayed in the game because the other pitcher was battling an injury as well. We won that game but lost the next one, afterwards my parents took me to Children’s Hospital where I received 6 stiches in the gash on my leg. I’m a typical teenager when I’m not on the field, I like to watch movies, listen to music while doing art on my sketch pad. I also enjoy talking with my best friend Avery “Ace”, we snapchat funny things to each other, sleepovers with my teammates, youth group with my friend Faith, all typical teenager things. Ever since I was little my parents said I have always been self-motivated. I’ve always strived to be the best in everything I did, school, art, friendly competitions and sports. I’ve never let CF stop me from being the best that I can be. When I was younger softball teams might have passed on me because of my disease but I used that as motivation to get me where I am today. I use having CF and being a pitcher as motivation to be the first college pitcher with Cystic Fibrosis. Having CF is hard, especially when you are competing against others who don’t have to work as hard as you do just to be able to play. I’m also motivated to exceed the life expectancy, to have my own family, to not leave my brother or parents at an early age. I exercise to make sure I’m staying ahead of CF, but I also exercise for my team. I have to make sure I’m at my best health, if not my team is down a player or I’m not able to give my best. I’m fortunate that my passion for pitching helps me with strength and endurance, and that practice helps me to play at a high level against some of the best teams in the nation. Also for accountability to my team, I want them to hold me accountable and not let me slide because I have CF. But I also exercise today to improve my future self after I stop playing softball. I’m 13 years old, my mind is open and often changes. I’ve wanted to be a marine biologist, racecar driver, real estate agent to an interior designer. I have plenty of time to figure it out! I want to have my own family most of all. My mom, she is always in the hospital with me when I’m admitted. She works a full time job as a teacher, she has a small business she does from home and spends hours upon hours a month on the phone with insurance companies to make sure I have the medicines I need. My dad, for spending countless hours in the yard on a bucket, driving me to practices and lessons. For giving me advice about life and faith. Find a passion and go after it! Don’t let having CF be a reason to not be the best basketball player, tennis player, soccer player, football player, swimmer or lacrosse player on the team. My passion has been softball, I wasn’t very good at it when I began at 5 years of age, but when I started to put the work in consistently that’s when I started to see the improvements. Treatments and exercise become part of your daily living, you can’t take too many days off or you start to feel run down. I make sure that I use my love for softball as a way to exercise as well as practice even in the offseason. Being a pitcher I have to practice 4-5 days a week, even on those days where I’m feeling a little tired. Do something even it’s just for a few mins. On days when I’m short on time or a little run down I’ll do jumping jacks, pitching drills, body squats, walk up and down the stairs at the house or run mail box to mail box. Make sure you’re putting good things back into your body after exercise or games/practice. In between games I like to snack on peanut butter, Rev Wraps, apples and pickle juice (to put salt back into my body that I’ve lost) plenty of water as an example. Ballfield food isn’t very healthy and I have to make sure I’m eating good to keep my energy up. Even if you get admitted to the hospital stay as active as you can. Just a few hours after my last bronchoscopy I walked two miles on my floor to get my recovery started. Teenagers like myself have to have balance, we have to make sure we are getting our treatments in daily, homework done, social life and sports. We have tons of distractions so we need make sure we are making our health a priority. If you’re on Instagram/Snapchat for 30 mins, exercise or practice your sport for 30 mins too. Lastly, inspire someone with your hard work and dedication!